Now with its ninth consecutive generation in the business, the Betts family has been directly associated with the recovery of precious metals and the jewellery industry for over a quarter of a millennium. Betts Metal Sales focuses on servicing the needs of manufacturing jewellers, designers, jewellery students and hobbyists by supplying a comprehensive range of bullion and jewellery supplies, backed up with excellent customer service from highly experienced staff. Betts Metal Sales sells bullion (such as sheet, wire, tube, solder and grain), wedding ring blanks, stampings, castings, findings and finished jewellery in platinum, gold, palladium and silver. They also offer jeweller's tools and a comprehensive range of jewellery services, such as hallmarking, polishing and engraving. 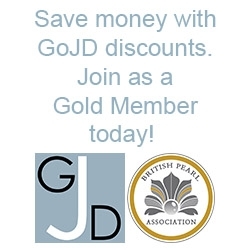 Betts Metals is happy to give GoJD Gold Members a 5% discount on silver products - please login and visit the discount page for access to discount and ordering information.